The 3600 sq km big Peninsula Valdez in the province Chubut is one of the nature treasures of Argentina. It bustles of abundant wildlife: Sea Lions, Elephant Seals, Guanacos, Rheas, Penguins and different kinds of birds. 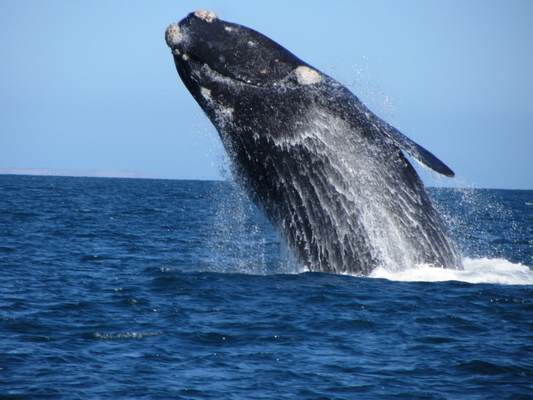 But the star is the nearly 12 meters long and 27 tonnes heavy Southern Right Whale. Female bear young and breed in springtime in the shallow waters of the bays between the peninsula and continent. Peninsula Valdez is a World Heritage and consequently protected accordingly. In its center is one of the lowest depression in South America with salt lakes up to 42 meters below sea level. Few hundred km North and 40 km East of the city Viedma is the village Balnerio El Condor with maybe the largest Parrot colony of the world: More or less 35,000 dens of parrots are in its cliff faces. 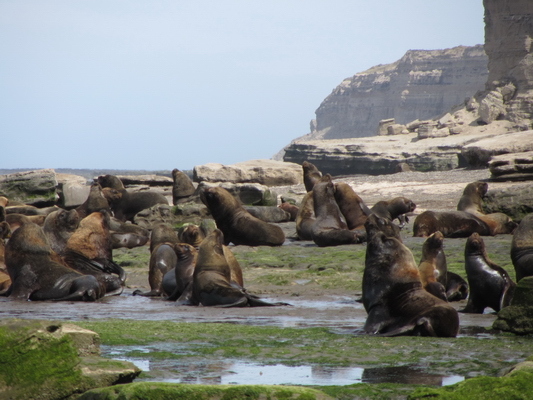 Close is an outstanding Sea Lion colony in La Loberia with several hundred animals. In La Loberia access to the beach is possible due to a steep glen in the 30 to 50 meters high cliffs. There are just few cottages, one hotel and a police station in La Loberia. We stepped down to the beach and were a little bit disappointed that we saw no sea lions. And nobody to ask. We headed South and after approximately one hour walking a sea lion was sitting just in front of us. The ocean came more and more back and Marion became a little bit concerned how to return. Alfred continued to he next bay and was suddenly close to countless sea lions. There is a viewpoint just above the colony, which we visited next. We continued the rough road along the cost via Bahia Creek and Punto Mejillon tovPuerto San Antonio Este. Somehow our car managed the dunes on the way but we had to push a 4 wheel car with trailer out of the sand. Peninsula Valdes has just one settlement: The busy Puerto Piramides on the Golfo Nuevo with many hotels, restaurants and tour agents. But you can spot the whales just from the beach and cliffs. We spent the night at the campground of Puerto Piramides with hot shower, which we desperately needed. Our idea was to drive the triangle on the peninsula on the next day and to stay one night in the wilderness because it is a rough and not tarred track of more than 200 km. The start was beautiful with the salt lakes in the depression. We arrived at lunch time at the southeast corner of the peninsula Punta Delgada with a lighthouse. There was a sign several hundred meters in front that access only possibly via the hotel and restaurant Faro Punta Delgada Hotel. After arriving at the restaurant a Lady came to us ant told us that the access to Punta Delgada is closed due to heavy wind and if we really want to eat here. Ok we realized a strong breeze but we intended to take our lunch there and we ordered sea food. The lunch was tasty but expensive and we had to wait 1.5 hours. And again 1 hour for the bill, really a lousy service. After our lunch we wanted to walk a little bit but there were every few hundred meters strange signs that it is not allowed to leave the car. Ok we accepted this and continued along the east coast to Punta Cantor. Thanks to the service it was already very late and it became dark. We intended to sleep in the middle of nowhere of a remote parking place between Punta Cantor and Punta Norte and we cooked and took a delicious dinner with some red wine. At 11:00PM a female ranger came and she was rude. She forced us to drive 120 km in the night back to Puerto Piramides. There was neither a prohibition sign at the parking place nor somewhere else on the road nor a hint in the information sheet of the Peninsula Valdes. Her argument was protection of the nature. It can be questioned if driving back in the night 120km through a steppe with busy wildlife and back the next day impacts nature more than staying a night in the car on a remote spot. Fortunately there is a free motor-home parking place in Puerto Piramides, where we slept long the next morning. A Swiss traveler gave us the hint that there is a good campground 30 km South of Puerto Piramides in the wilderness, where you can see Whales. We told him our story of the last night and he replied that there had been the Police last night: There were very friendly and nothing similar happened. Sometimes Argentina is a mystery. We found easily the nice campground (GPS coordinates S 42° 37.080' W 64° 15.615') and met the German couple Diana and Ruediger there. The weather became a little bit ugly with storm, but we detected several whales in the water. Suddenly a dead whale baby occurred on the beach. This was a very sad story. A French Lady left immediately the area with her husband. Diana asked an Argentine family, who returned to Puerto Piramides, to inform the rangers. But we had the chance to see a whale as close as possible. We spent a nice evening with Diana and Ruediger, see their webpage www.ruedi-unterwegs.de. They recommended strongly to do the boat trip in Puerto Piramides, which is an outstanding trip. Thanks Diana and Ruediger! We never will forget this night. For sure more than ten Whales stayed the night in the bay close to us. We heard them breathing, snoring and paddling in the water the whole night. A very peaceful but exciting experence. The weather on the next morning was excellent, so we decided to follow their suggestion. But first we did a walk on the beach in the morning with exiting views. The boat trip was an unbelievable experience: Whales were jumping, swimming under our boat, playing and so on. They came so close to our boat that we had the feeling we might touch them with our hands. When we returned ashore we met Diana and Ruediger. They were a little bit white paled, because they had just watched the dissection of the dead Whale Baby. Specialists had done the bloody job because there is an unusual high quantity of dead Whale Babies this year and they have no idea why. For them it was a good opportunity to do the investigation on a relatively new dead Baby. We spent the next evening and night on the other side of the bay in Puerto Madryn, which had been founded by Welsh settler in the year 1865. They had survived only because the local tribe Tehuelche had supported them. Today 20% of the people of Chubut have a Welsh origin. But there are some Germans too. Hallo Ihr Lieben, ich habe wieder mal nachgesehen wo Ihr seid. Meinen Rucksack packe ich erst im Februar wieder.Ich werde die Megellan bis Puta Arena entlang schiffen,eine Trekkingtour unternehmen. Vielleicht fliege ich auch auf die Osterinsel - mal sehen. Es wäre nett, wenn ich einen Partner- in bekomme, ansonsten muss ich ein Gude nehmen. Mittlerweile war ich in der Gobi Wüste , es war traumhaft schön. Eure Fotos sind fantastisch, ich kann Euch nur beneiden. Weiterhin schöne Reise und viel Glück mit den Auto.